Specificity:Antibody can detect endogenous GAPDH protein. TDY421 detect Fusarium graminearum Endogenous GAPDH protein. 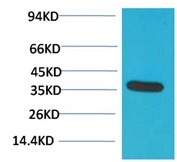 Western blot analysis of Hela with GAPDH Rabbit pAb BE3407 diluted at 1:10,000. Immunohistochemical analysis of paraffin-embedded Human Breast Carcinoma using GAPDH (BE3407）Rabbit pAb diluted at 1:500.